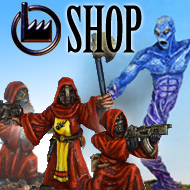 For anyone who hasn’t seen it yet, I’m proud to have put my first sculpts on a Kickstarter. It’s already funded so will definitely go ahead, and the group below is available for only £14 including UK P&P (bit more if you are overseas). It ends in less than a week, so get on board now! They are 5 orcs and a goblin, traditionally sculpted and cast in metal. Ideal for assaulting agricultural homesteads or perhaps an underpass. Didn’t realise you were doing this. happily backed – they look fab.